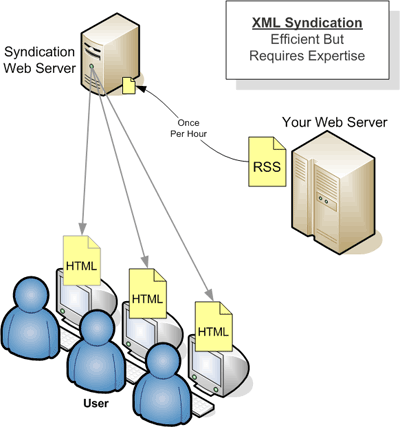 If you are syndicating to websites that are not under your control, you don't know that the webmaster will have the expertise to implement a syndication strategy using XML. 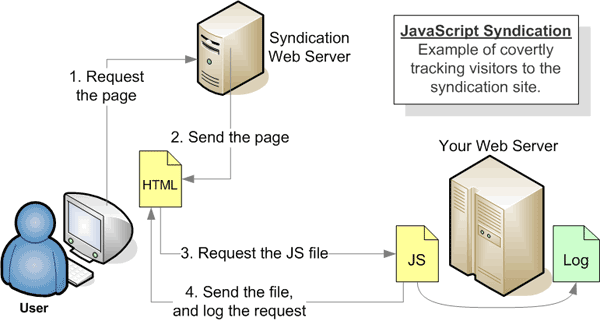 You might be syndicating to a small company that used FrontPage to make the website; they certainly can't set up a dynamic process to fetch an XML feed from your site, cache it, and integrate the data into their site. For the target website, implementation is simple: just add one line of HTML to the target page. 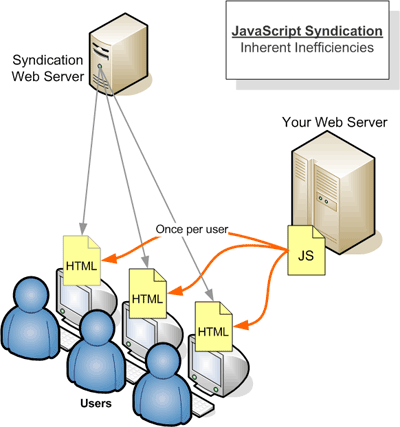 It works for any web server environment -- you don't need server-side technologies such as PHP, Perl, Python, or Java. When you update the content on your site, changes are immediately reflected on syndication sites. With cached solutions such as RSS there is typically a self-imposed delay of up to an hour. You can control how your content is presented, or you can allow partners to customize the presentation. Even with the simple example above, some problems might occur. In the example above, we displayed static HTML, but what if we want to display dynamic information? For example, we might want to query a database and display the time of the next live event. Button, button... who's got the button? The examples so far assume that every website would display the same syndicated content, but you can use parameters to customize the output for each of your syndication partners. Clever technique for creating an XML button without using a graphic. Patrick Fitzgerald is a writer and web design consultant in Atlanta, Georgia.